The study aimed to study the accuracy in RR time series derived from the seismocardiogram when employing different heartbeat detectors in subjects measured in a quiet environment. The ECG and seismocardiogram of 17 healthy volunteers was recorded at a sampling frequency of 5 kHz using a Biopac acquisition system. The seismocardiogram was acquired using a triaxial accelerometer (LIS344ALH, ST Microelectronics). Four detectors of the heartbeat from the seismocardiogram were employed relying either on the Continuous Wavelet Transform or bandpass filtering. The detectors adapt their parameters to the morphology of the signal by estimating mean heart rate and the bandwidth of the signal associated to the heartbeat. For all detectors, the standard deviation of the error in the obtained RR time series is in mean slightly higher than 2 ms and the percentage of obtained RR time intervals that have an error higher than 30 ms is around 3.5%. The seismocardiogram, when measured in a quiet environment, can be used instead of the ECG to obtain reliable RR time series when using proper heartbeat detectors. Garcia, M. [et al.]. 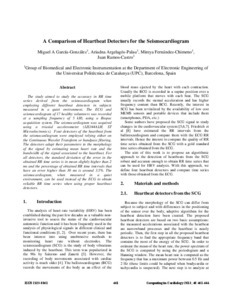 A comparison of heartbeat detectors for the seismocardiogram. A: Computing in Cardiology. "Computing in Cardiology 2013, vol. 40". Zaragoza: Institute of Electrical and Electronics Engineers (IEEE), 2013, p. 461-464.